It’s that time of year when we take stock of how the big tech companies have fared over the past 12 months, and they don’t come any bigger than Apple. So how did Tim Cook’s merry band of engineers, designers and geniuses perform in 2018? Note that we’re going to focus on the computing front here – Apple’s PCs and notebooks – but we will also touch on the iPhone and iPad, and the company’s mobile fortunes. Looking at the firm’s balance sheet as a starting point, Apple achieved a massive milestone this year, becoming the world’s first trillion-dollar company. It reached the 13-figure market valuation in August, although Amazon wasn’t far behind, hitting the magic trillion number the following month. Still, when folks look back in the history books, it will be Apple’s name recorded as the very first trillionaire. And as you might imagine, the organization didn’t manage that feat without packing in some impressive sales throughout the year. For the most recent quarter (at the time of writing – fiscal Q4 2018) running up to and including September, the company took a total of $62.9 billion (around £50 billion, AU$88 billion) in revenue, up 20% year-on-year. Unsurprisingly, a lot of that was driven by the iPhone, and while the actual number of smartphones shifted remained roughly the same as last year – albeit with a very, very slight uptick – revenue grew by a strong 29% (reflecting the growing premium on the handsets). However, this isn’t quite the full story with the iPhone for 2018, because chatter from industry sources including suppliers, analysts, and retailers, is that the new models of the phone – the iPhone XS, iPhone XS Max, and iPhone XR – are struggling more in terms of sales. Apple has also reportedly cut production orders on these models. For its part, Apple is insisting the iPhone XR is a success – or at least a relative one compared to the XS models – but the fact that the firm announced it will stop sharing figures on the number of iPhone units sold in its financial results has raised some eyebrows. Meanwhile, the iPad isn’t faring so well going by the latest Q4 figures, with Apple’s tablets slumping 6% year-on-year in terms of units shifted, and revenue was down further at a 15% drop. On the computing front, Mac shipments were down very slightly (2%) at 5.3 million units in the quarter – compared to 5.4 million in Q4 the previous year – but those sales generated a revenue of $7.4 billion (around £5.9 billion, AU$10.3 billion), which was actually up 3% year-on-year. That’s not a bad result considering that last year was a strong Mac performance from Apple (up 25% in Q4 of 2017). This year witnessed the introduction of new MacBook Pro with Touch Bar models equipped with faster 8th-generation Intel Core processors. The larger 15-inch notebook got turbocharged with a six-core chip (capable of boosting up to 4.8GHz on the top-end CPU), with the 13-inch spin having a quad-core processor. Those who are hungry for power to tackle computing-intensive tasks also got the ability to beef up the system memory to 32GB in the 15-inch MacBook Pro. 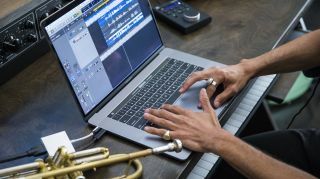 So there’s no doubt that you can now spec up a much more powerful MacBook Pro than was possible before, plus Apple added a True Tone display – which intelligently adjusts the screen to match ambient lighting conditions – along with a revamped third-generation keyboard designed to keep typing noise down. While the performance boosts are clearly welcome, particularly with the 15-inch MacBook Pro, connectivity issues persist, with a lack of ports still evident. And some of the fresh features introduced, like the self-adjusting display, are aimed more at consumers, and may not appeal to professionals (who will doubtless be more interested in color accuracy than what they may view as automated gimmickry). There’s a danger Apple is forgetting its target audience here, at least to some extent. Also, these notebooks remain seriously pricey. And, of course, if Apple is trying to cultivate a greater level of mass-market appeal in some small measure, that very much still works against this. As for the MacBook Air, there was disappointing news on the price front here, too, with 2018’s model being the most expensive entry-level one to date. Granted, there have been some nifty improvements, including a gorgeous screen, and the refreshed machine is supremely portable, but it doesn’t step up much on the performance front, only running with a dual-core Intel Core i5 processor with a base clock of 1.6GHz. As we noted in our review, the MacBook Air 2018 felt a touch sluggish at times, as if the processor was struggling (particularly when multitasking). And given the ramped up asking price, we don’t really feel that’s good enough. We didn’t see a vanilla 12-inch MacBook this year, and some have even wondered if this MacBook Air is effectively a replacement for that model. But if that’s the case, it’s barely any more powerful than the old 12-inch machine, which doesn’t seem very satisfactory. However, it’s still possible we’ll see a new 12-inch MacBook in the spring of 2019 (or at some point next year). Okay, so while we’ve got mixed feelings about the new MacBooks, what can’t be argued about is that the return of the Mac mini represented a stroke of genius from Apple. The refreshed compact PC packs a hell of a lot into a small box, and is hugely faster than its predecessor, boasting 8th-gen Intel Core processors (up to hexa-core, with boost of up to 4.6GHz) and the potential to cram in a hefty 64GB of system RAM. As we observed in our review, about the only weak point here is the integrated graphics, but that can always be resolved by hooking up an external GPU box (to one of the four Thunderbolt 3 ports) when greater pixel-pushing power is needed. The price might look expensive on the face of it, but in actual fact, compared to rival small form factor computers, the Mac Mini is very competitive. This little machine represents a definite victory for portable and flexible computing in 2018. In September, Apple released the latest version of macOS (10.14). Mojave arrived with a new Dark Mode for more comfortable working in a dimly lit environment, as well as the Stacks feature, which makes it easier to keep your desktop organized and your files more manageable by grouping files together based on their format (or tags, or other specified means). Finder was also honed, with the addition of Quick Actions to let you perform swift edits on files, right there and then, and a new screenshots tool was welcomed by those who like to take snaps of their desktop or its contents. In short, the new version of the desktop OS had some useful features, and of course you can’t argue with the fact that the upgrade is free. One downside here: the hardware requirements for Mojave mean that some older Macs are left out in the cold (pre-2012 or pre-2013 devices, depending on the exact model). That’s a marked contrast to the move from macOS 10.12 Sierra to 10.13 High Sierra, where the system requirements remained practically unchanged. Throughout the year, it has become increasingly clear that Apple has some major ambitions in terms of augmented (and virtual) reality. From job listings and staff hiring through to patents and a range of acquisitions including Akonia Holographics – a startup that makes lenses for augmented reality (AR) headsets – the evidence of Apple being serious about making its own AR glasses has been mounting. According to the grapevine, Apple reps secretly attended CES back at the start of the year in order to have private meetings with AR component suppliers. By all accounts, it seems that the company believes it can succeed where the likes of Google Glass have failed. Everything has remained very much behind the scenes in 2018, but the rumor mill reckons that we could see Apple’s AR headset on shelves in 2020, with the gadget to get an initial reveal next year. In the year that Apple became the first trillion-dollar company, not everything has been smooth sailing for Captain Cook and his crew. The iPhone is still raking in huge amounts of cash, but there are question marks over the sales of Apple’s latest phones, with some analysts predicting a decline next year. Although we won’t know for sure if this happens because Apple will no longer publish its units shipped figures (with some interesting and potentially controversial timing therein). At any rate, the iPhone could be a weaker spot for the company next year, although given the hefty premium on the handsets, the profits are still likely to be rolling in. Apple seems determined to keep that premium on all of its products, and it was certainly disappointing this year to be greeted with a MacBook Air that definitely wasn’t a budget-friendly model (as some had hoped for and was rumored earlier in 2018). MacBook Pros remain as pricey as ever, and overall, it was a let-down to see no relief for those who are, shall we say, cost-fatigued when it comes to Apple’s notebooks. The MacBook Air also felt lackluster on the performance front, although there was good news with the MacBook Pro models, which were seriously beefed up in terms of the hardware, particularly the 15-inch spin. Even the new Mac mini isn’t cheap, but this is a great little PC which is around four times quicker than its predecessor, not to mention more than competitive with high-end rivals like Intel’s NUC boxes. Looking to next year, we’d like to see some clarification of what Apple is doing with its notebook range – will there be a new 12-inch MacBook, or has it effectively been replaced by the MacBook Air 2018? And we’d be delighted with some downward movement on prices, but we also wished for that last year, and furthermore, the likelihood of this happening is shaky when profits are still pushing forward for Apple’s computers and notebooks. We will likely see Apple’s new AR glasses unveiled next year, which should be exciting, although we’ll have to wait a bit longer for the prospect of MacBooks with custom-made ARM processors inside – these may not be realized until 2020 or even 2021 according to the latest from the grapevine.